From touring caravans to motorhomes, then static caravans, the Swift Group founded back in 1964 expanded in the 80s. 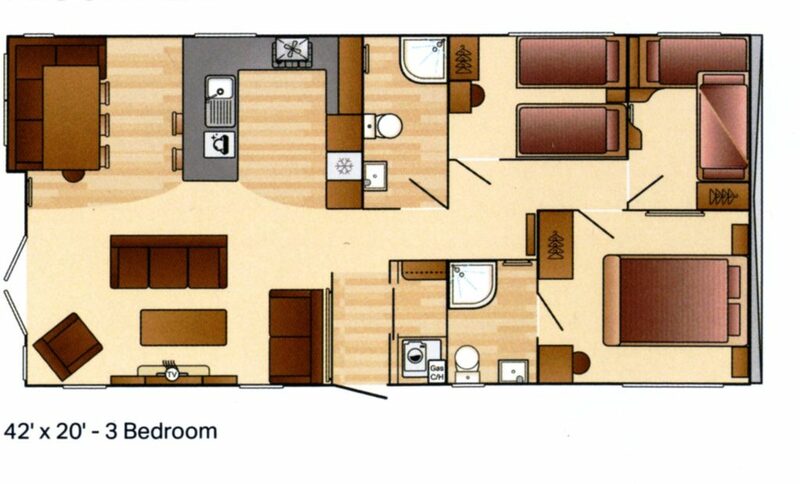 Developing new caravan and motorhome models using advanced design in aerodynamics, statics and lodges wouldn’t follow ‘til 2005, with twin lodges being a more recent development. 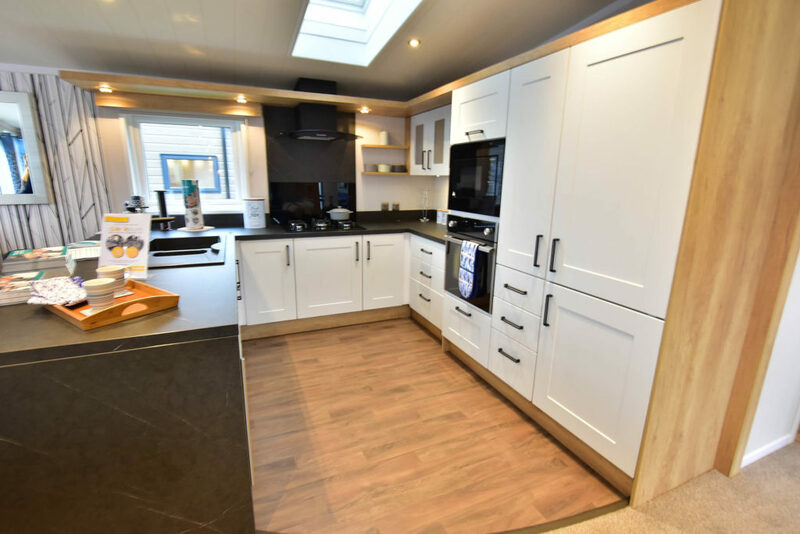 Swift’s first statics were a learning curve but within a few years the Swift brand was quickly established in the holiday caravan market. 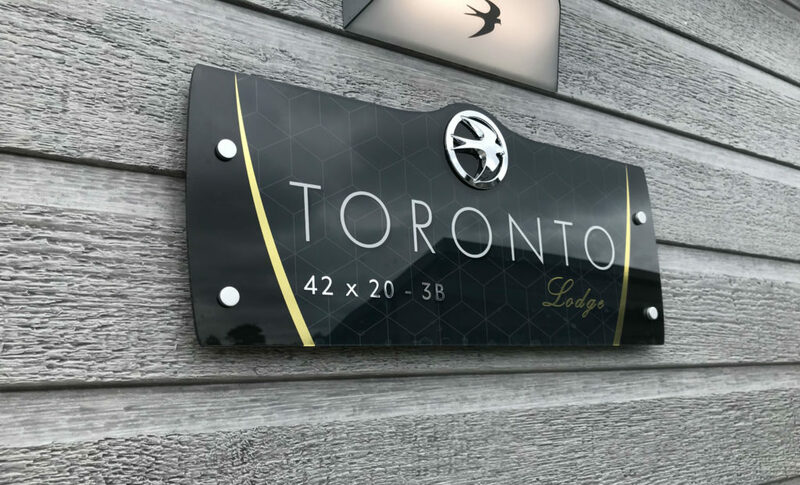 With the launch of the luxury Whistler twin lodge, it was no surprise when in February they gave us a sneak peak at a new twin lodge then still in development. This would be the Toronto for the 2019 season. 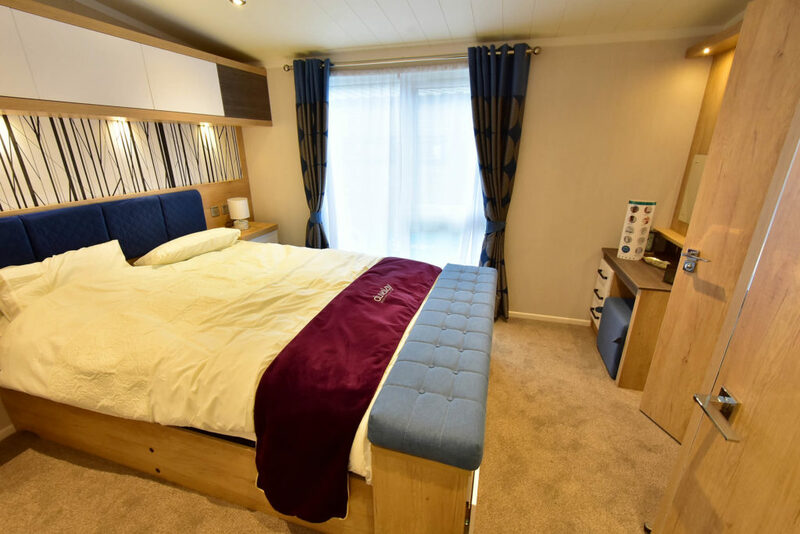 Impressed with the images – in the flesh this new twin lodge is even better! 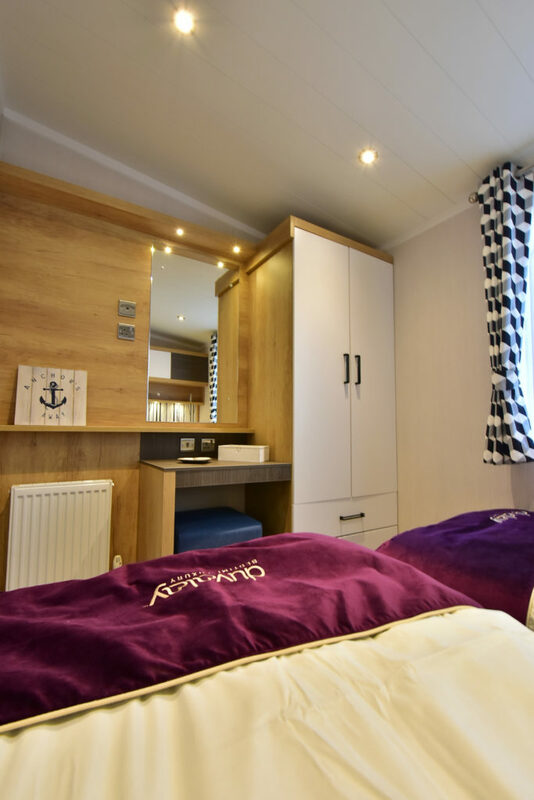 Built using bonded construction as touring caravans, Swift claim it has higher insulation properties than a conventional constructed lodge. As with all Swift statics and lodges they’re built on firm foundations. The Toronto is built using a Fusion fully galvanised chassis, complete with a peace-of-mind 10 year anti-corrosion warranty, as standard for 2019. It’s also built to enhanced residential specification BS3632:2015. 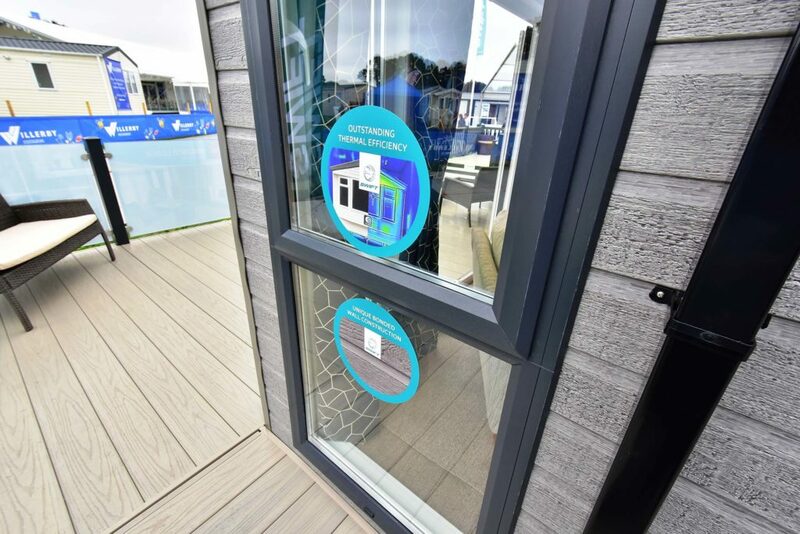 With the exterior finished with Canexcel durable composite panelling and domestic standard guttering and down spouts, the Toronto is definitely built to last. LED lighting is placed under the front eaves and the Toronto also has an exterior mains socket too. UPVC double glazed windows have Thermaglas. While the front French doors are the main entrance to the Toronto, there’s a side door taking you through to the utility room. So stepping inside the Toronto, with its three bedrooms, you can’t help being impressed by its space and style. The dining table is placed in the front left corner with three standing chairs and corner wrap around seating, giving a really relaxing area. Opposite, the designers have placed the lounge – it’s another comfort area with free standing sofas, coffee table and wall mounted TV. The lounge has some rather useful wall shelving, complete with ambient lighting and electric imitation log burner. 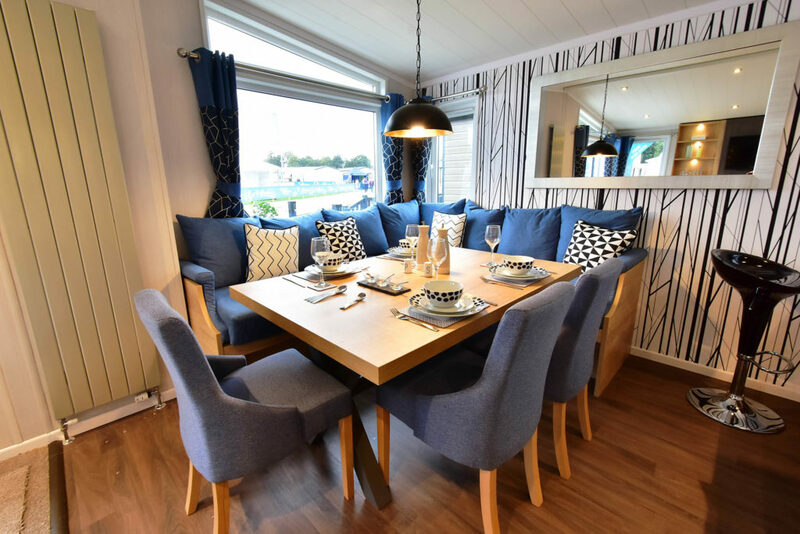 This lodge is designed for family use – up to seven in fact – so a decent sized kitchen is needed and the Toronto kitchen comes with a cracking worktop and that all-mportant breakfast bar, complete with three chairs. We liked the roof Velux and the specification including a 12 place dish washer and wine cooler. Walk to the back of the Toronto and on the right a small utility room houses the washer/drier. The hallway has an attractive stand alone floor shelf with wall light above – it adds to the overall style of the Toronto and is a nice touch. The communal bathroom has a Velux roof window (no side window in here) and a large walk-in shower. 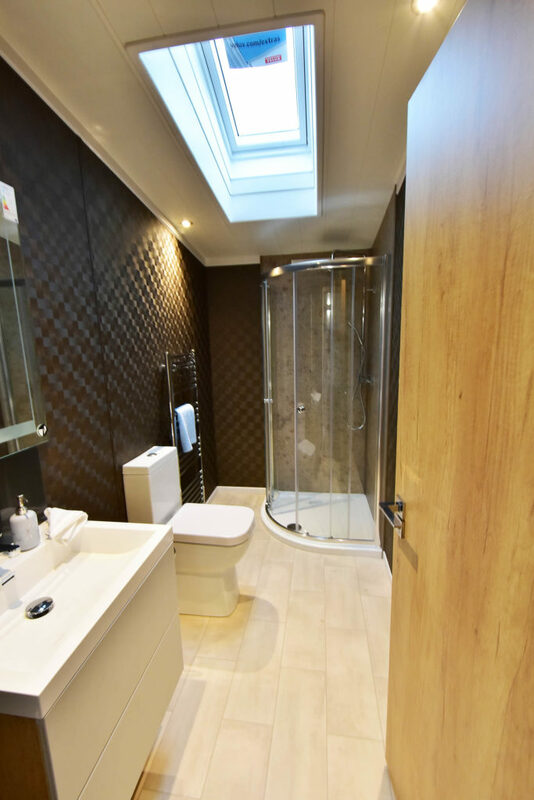 It’s also quite a large room with good floor area and a large hand basin is fitted. Again it has modern overtones, keeping in line with the contemporary theme. The first of the three bedrooms we looked at was the twin room. It’s got plenty of space and the beds are comfortable too. A wardrobe with built-in drawers, plus dressing table and stool, with large mirror will be very useful for getting ready for the day. Next door is the kids’ room. 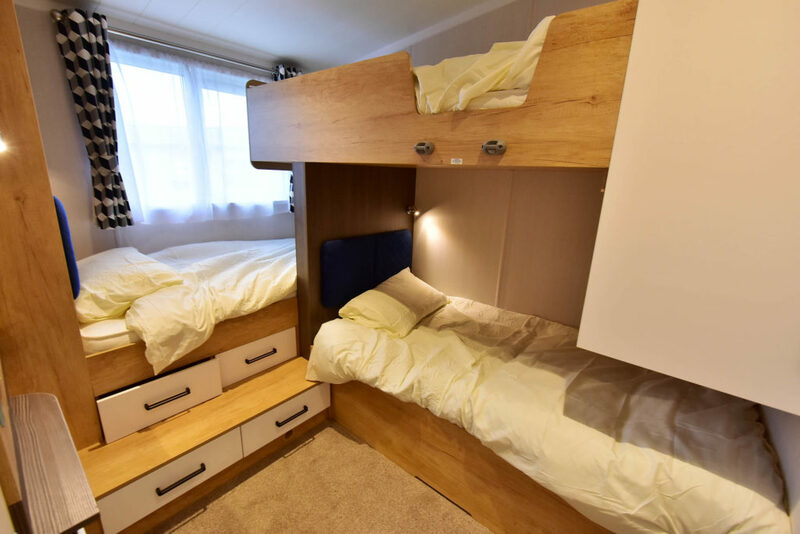 It’s got three single beds, including bunks, a single wardrobe is fitted and steps up to a side bed also have drawers fitted for more storage. Each bed has its own light, and a mirror comes with a small shelf and mains socket. Those who like a large master bedroom will not be disappointed with the Toronto. With storage a strong point, including a large overhead locker over the bed head, plus mirrored doors are on the wardrobe. 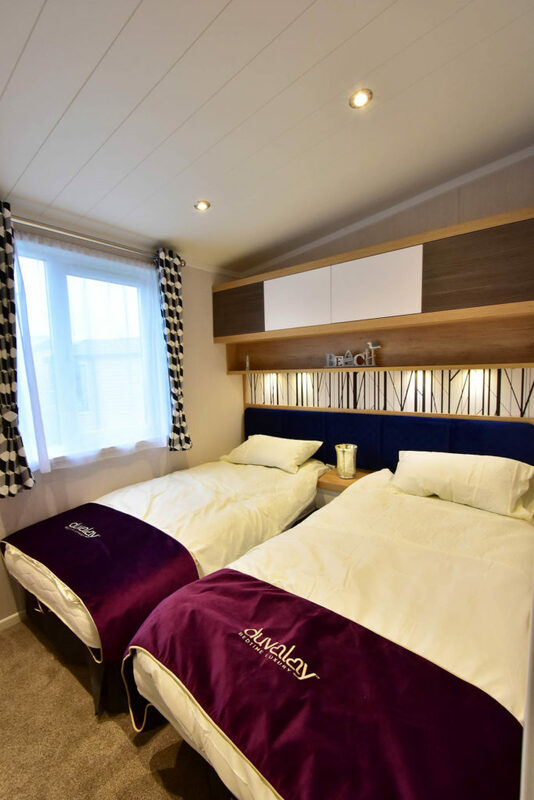 The bed is king-sized too, and as the twin beds is complete with a super comfortable Duvalay mattress. 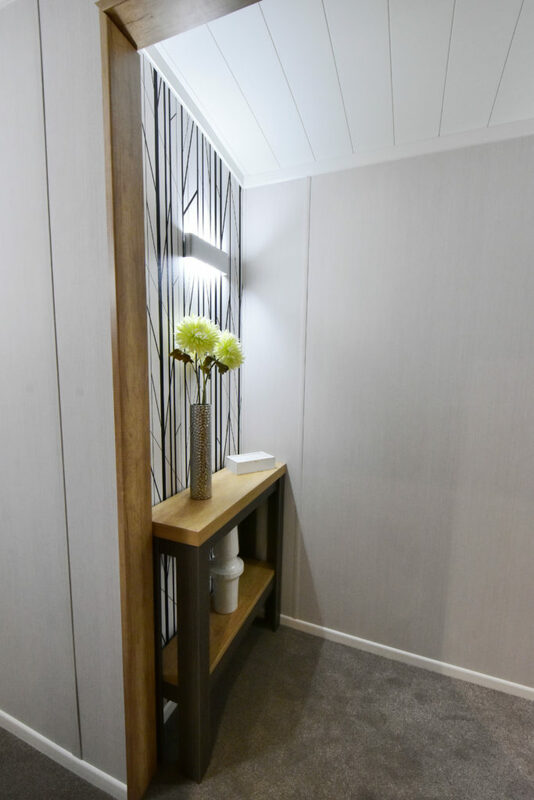 A dressing table is fitted with stool and mirror, plus a shelf, and there’s a roomy en-suite with walk-in shower, loo and hand basin. 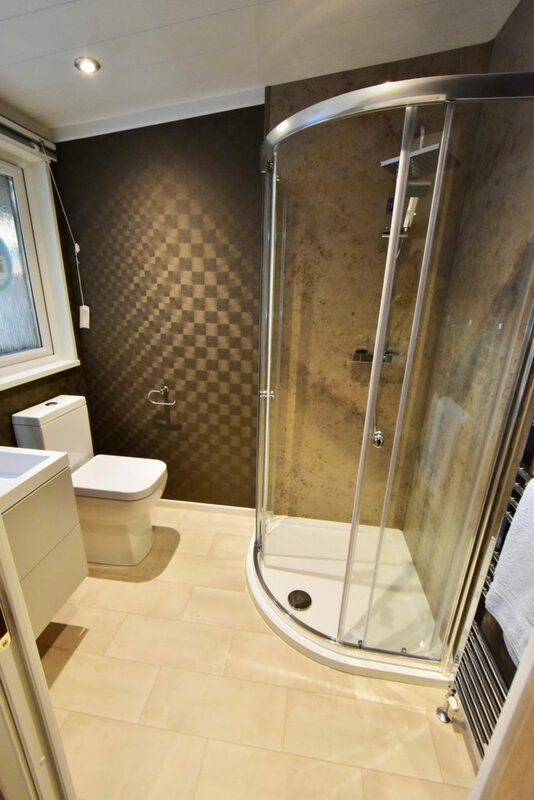 This bathroom does have a side window for natural light and ventilation. So this family lodge has got to be a winner! Verdict: This is a lodge that offers a large family plenty of room and a great kids’ bedroom too. Grandparents might also like the Toronto for family stopovers, plus the quality build and all-year use. Buyers will get great value out of the Toronto at less than £105,000*. Plus points: Wrap-around seating in dining area, large and well specified kitchen, kids’ bunk room, good sized showers, great bedroom storage, and bonded construction. Minus points: Small front window in dining area and small wardrobe in kids’ room. In a nutshell: 42ft x 20ft floor area has been well planned, we like the corner dining area though a larger front window would be good, but the Toronto is further proof of Swifts lodge development. 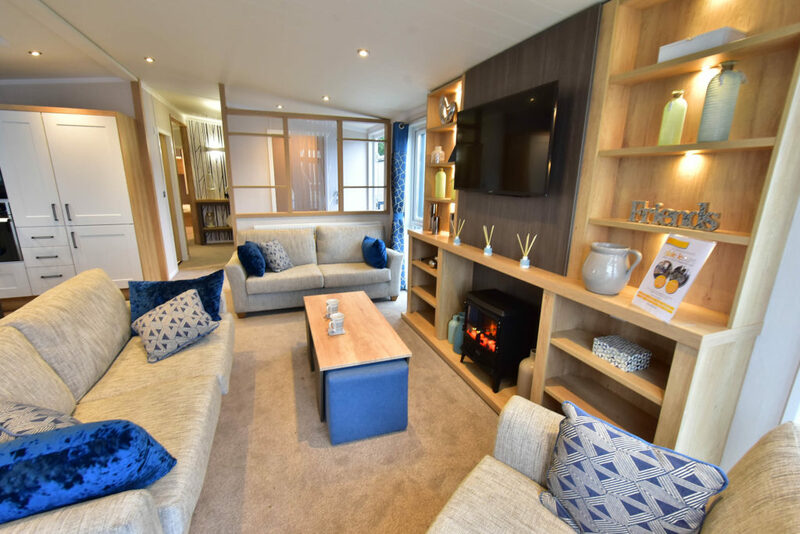 Other lodges to look at: Atlas Debonair 40ft x 20ft, Omar Alderney 45ft x 20ft three beds, Willerby New Hampshire 42ft x 20ft three beds. 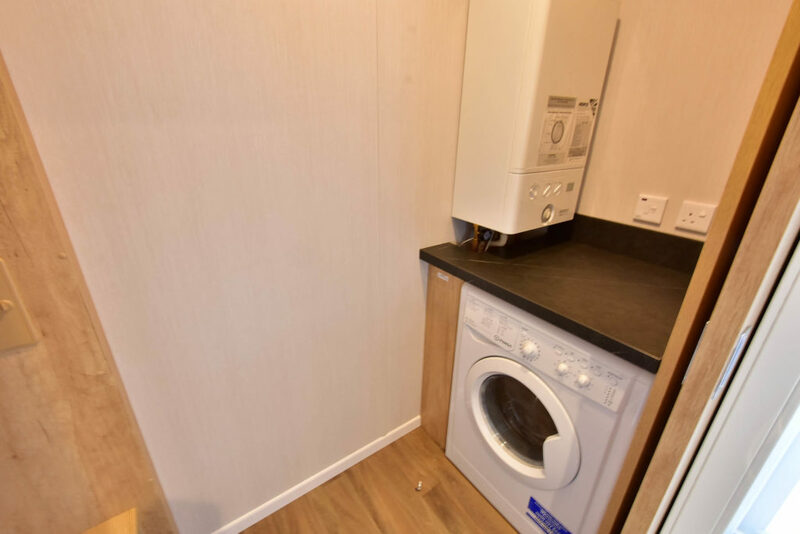 Key optional extras: Shaving socket in bathroom; premium comfort 22 high queen sized air bed with electric pump for extra sleeping; exterior opening door to master bedroom; cladding in choice of mist grey, Acadia green and Sierra brown. 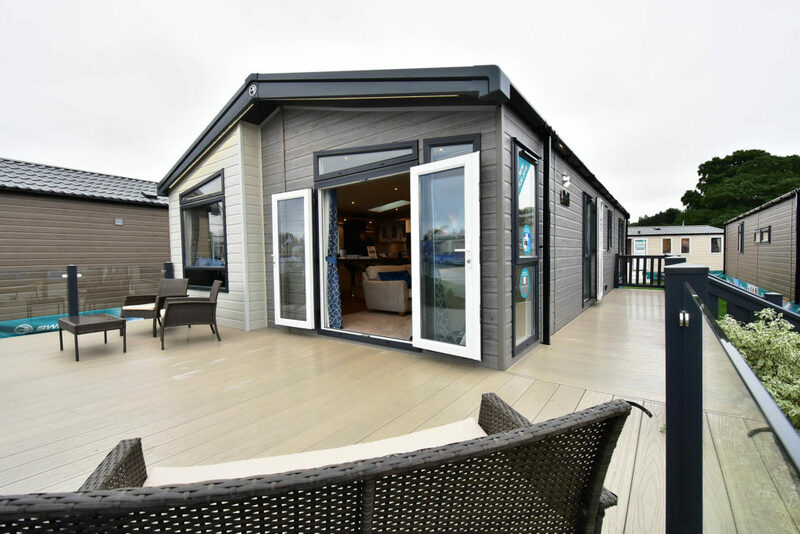 If you’re looking to buy this holiday lodge why not get a great deal insurance quote from us today. Click here to get your quote online.